The blurry eyes. The pounding head. The layer of fuzz on the teeth. And the confetti and party paraphernalia stuck in your hair. Could be New Years years morning... or just another Sunday. Either way, sooner or later you are going to need hang-over food. In my world, there are three things a hangover food absolutely must contain: potato, cheese (which also doubles as grease) and a little heat. My Minnesota background is studded with casseroles, hot dishes and one pot dinners. These are the most easy comfort food dishes available. 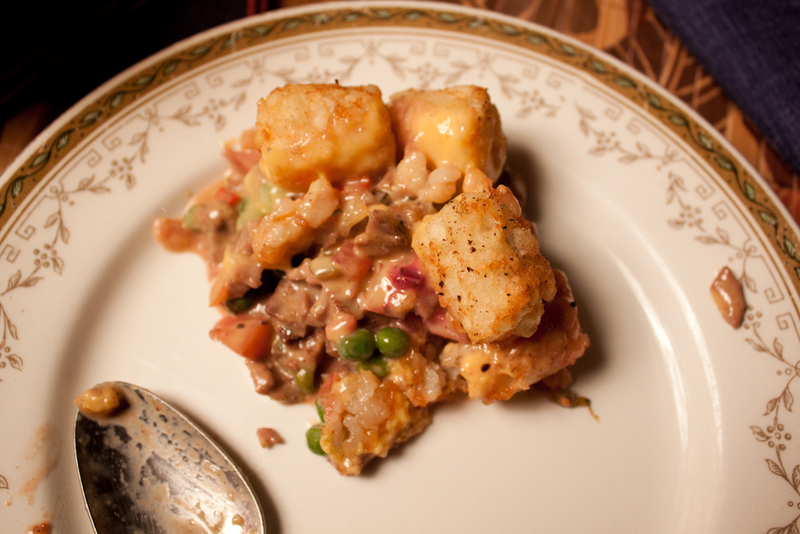 Mix any basic meat with a few vegetables, add a gravy-like substance along with some cheese. Voila! It becomes one of those meals you don't want to admit liking to your foodie friends, but secretly eat the entire dish. Don't over think this! Use what is left over from the party the night before. Turkey, hamburger, beans, carrots, asparagus (I used beets and turnips) ... the cheese and the tater tots are the real keys. If you happened to make the Fat and Happy Simple New Years Roast Beef Dinner, this is a perfect dish for the leftovers and for the stragglers still passed out in your tub. Whether your hangover is from celebration, just another night on the town or your just looking for something hearty and comforting, a tater tot hot dish is a Fat and Happy can't miss! Tips and Techniques: I'm taking the liberty to use Velveeta in place of cheese; the truth is that it just works better in these type of dishes. But feel free to substitute a shredded cheese in its place. Preheat the oven to 400 degrees. Pour the olive oil into a large sized pan over medium heat. Add the onions and celery, cook for about 5 minutes until they begin to soften. Add in the garlic, cook for one more minute. Cook until everything is heated through. Add in the peas, yogurt and Velveetea. Add salt and pepper and any fresh herbs you need to use up. Taste and adjust as needed. Pour the casserole into an oven baking dish. arrange the frozen tater tots on top of the mixture. 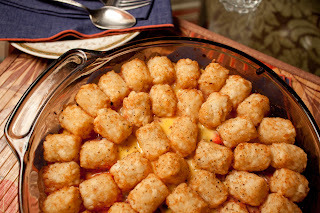 Place in the oven and bake until the tater tots are brown and crispy on top - approximately 25 - 40 minutes. Enjoy while hot, then take a nap. New Years Eve is a wondrous night, but it does not have to be a china-only night. It's possible to have a simple dinner party without the fuss. 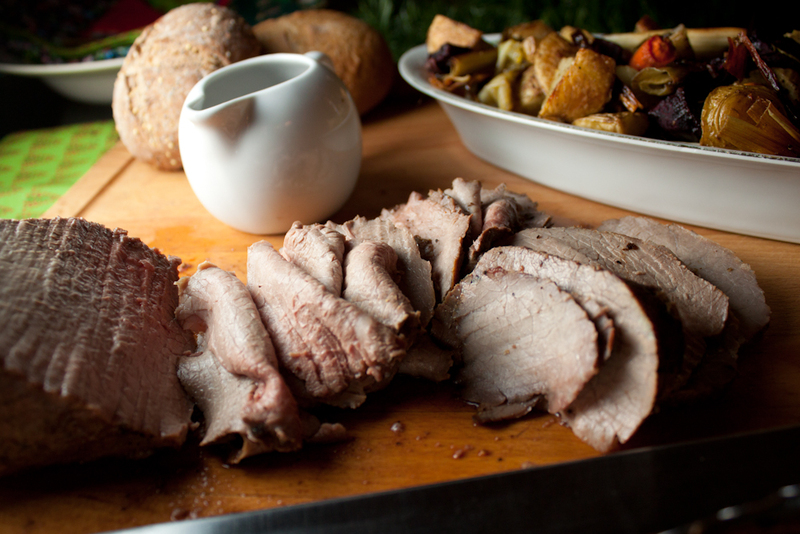 A roast beef allows for the option of a super sit down meal or simple sandwiches to nosh on all night long. A little seasoning on the meat, a few roasted veggies and this plan will allow you time to party with your friends and have left overs to boot. Two people or twenty, this dinner comes together pretty easily using a mix of homemade food and purchased food. 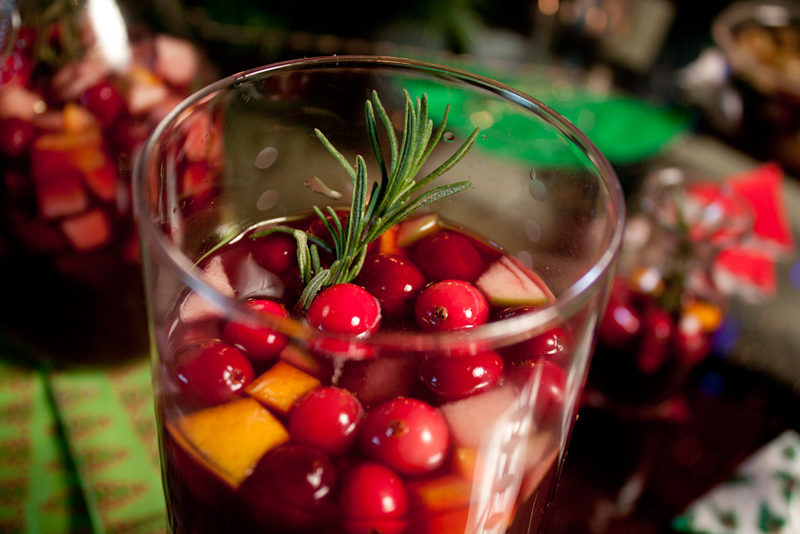 Who knew National Sangria Day is December 20th? How exactly do we, as a Nation, decide on these special 'days'? Is it on the yearly ballot and I'm just missing it? Did I not see the poll on Facebook? Or perhaps I missed the Tweetup? No matter, somehow I found out just in time to greet the day with a new recipe. To me, Sangria is more of a summer drink so it seems slightly odd the national day is in December. Warm and spicy comes to mind before light and fruity when it's 20 degrees outside. Making a warm wine drink would be too much like a glogg (hot mulled wine), but using spices like cinnamon and clove will lend both the warm and spicy aspect to this Holiday Sangria. A winter heartiness comes from the addition of port. Fresh rosemary rounds out the full holiday experience; then it all comes to together with a little fizz from classic ginger ale. Filling the glasses with cranberries tops off the ultimate festive look and feel. National Sangria Day or not, this Fat and Happy Winter Sangria is a wonderful addition to any holiday festivities. You can do that? This phrase is not foreign to me. Like when making marshmallows from scratch. Contrary to popular belief, marshmallows DO NOT have to come from a plastic bag at the supermarket. 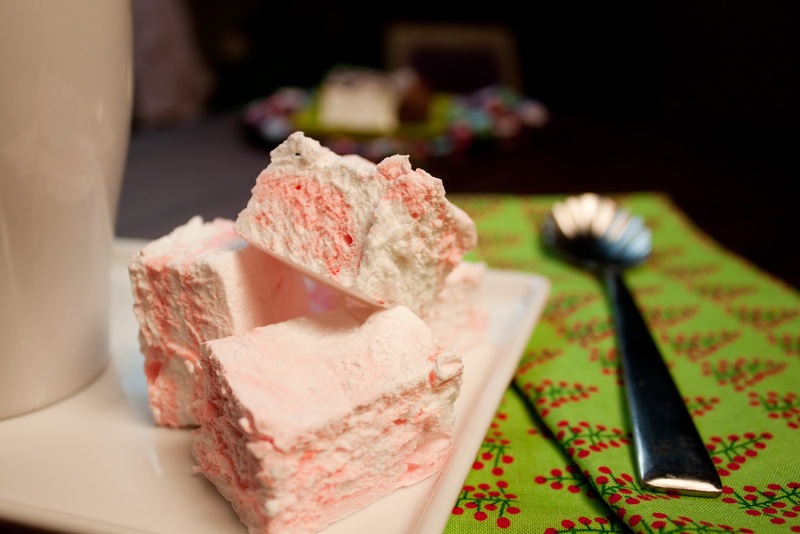 One of the great rewards about making homemade marshmallows, besides wowing your friends and family with your mad skills, is that you can flavor them. Peppermint, vanilla, almond, cherry, caramel, chocolate, maple - pretty much anything is doable. The process is fairly easy but messy. Luckily the clean up is a snap since it's all sugar. A little hot water and it all just melts away! However one requirement for making marshmallows is a stand mixer; unless you are looking for a good arm work out and want to hold a hand mixer for twenty minutes. Dave's birthday means it's time for a new birthday cake. He gets to decide what 'flavor' he wants and I get to create it. It's a win-win for everyone. This year he asked for a cake that tastes like a chocolate covered cherry. My goal is always to create something that hasn't been done before because I can't seem to accept simple solutions. Sure you could add some cherries to a box cake and probably get a fairly decent result. But if, for just a little more effort, you could end up with a WOW cake, why not?? The edges of this cake become slightly crunchy while the inside stays moist from the cherry filling. 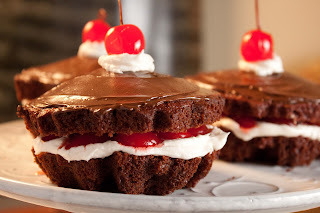 The frosting becomes a filling to emulate the gooey insides of a chocolate covered cherry. And just a little layer of chocolate on top rounds out the mouth feel. At first bite, the response reads as deep, yummy cherry and chocolate. And the cake is cute to boot! Super for a birthday but there is no reason not to make this Fat and Happy Chocolate Cherry Cake this weekend.